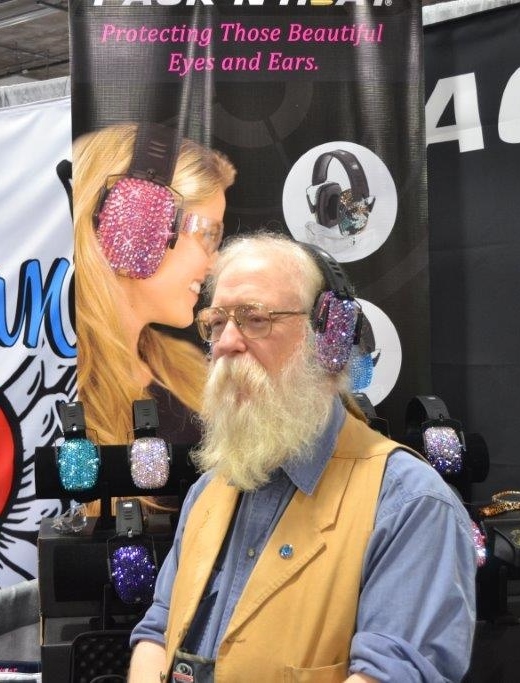 Day 4 – 2016 SHOT Show Wrap-Up! 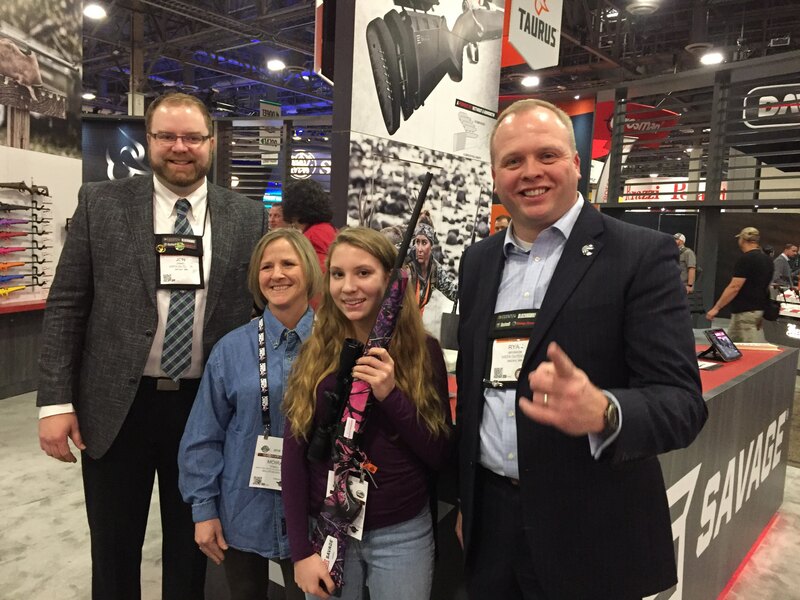 By the end of day 3 of the show, NYS4-HSS Assistant Director John Bowe, Instructor Colleen Kimble and Teen Ambassador Logan Kimble-Lee headed back home safely to New York leaving Director Bill Schwerd and Education Specialist Kenyon Simpson to wrap-up the last day of the 2016 SHOT Show for the NYS4-HSS Program. 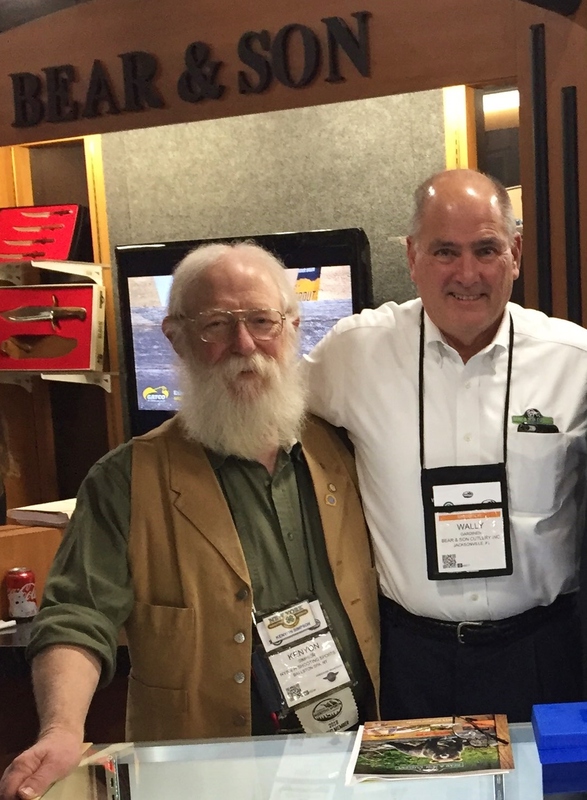 Day 4 found Bill and Kenyon meeting with numerous industry friends and strong supporters of 4-H Shooting Sports including Baron Technology, Burris Scopes, the Great American Tool Company, New York based companies KutMaster/Utica Cutlery, Empire Pewter, Redding Hunter and many others. Bill and Kenyon also met with reps from Spypoint of GG Telecom, a company that is working on the STEM (Science, Technology, Engineering and Math) component of NYS4-HSS programming in areas involving computers and cameras. 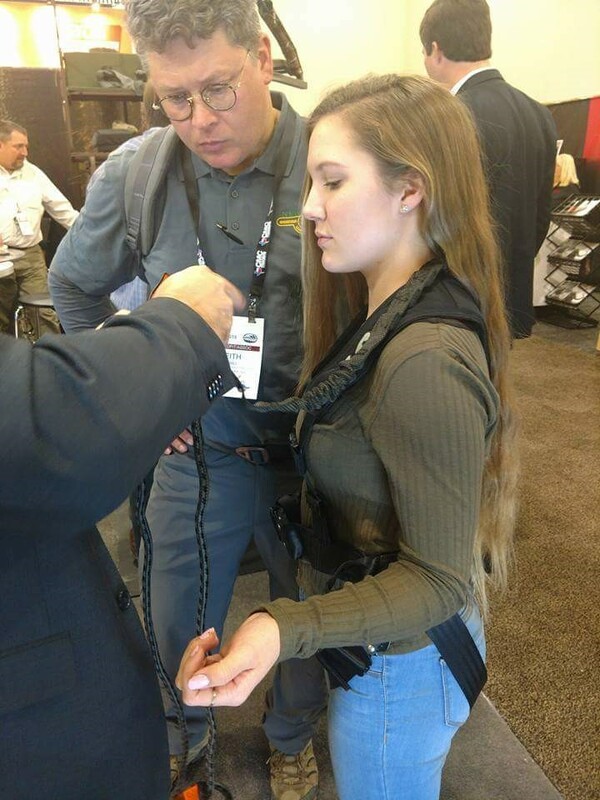 Other visits made throughout the final day of the SHOT Show covered several safe storage of firearms booths by companies such as Gun Storage Solutions, Snap Safe, Sentry, Browning and Liberty as well as booths featuring firearms safety related gear and equipment including new lux trends in protective headgear for women. It was a very full day! 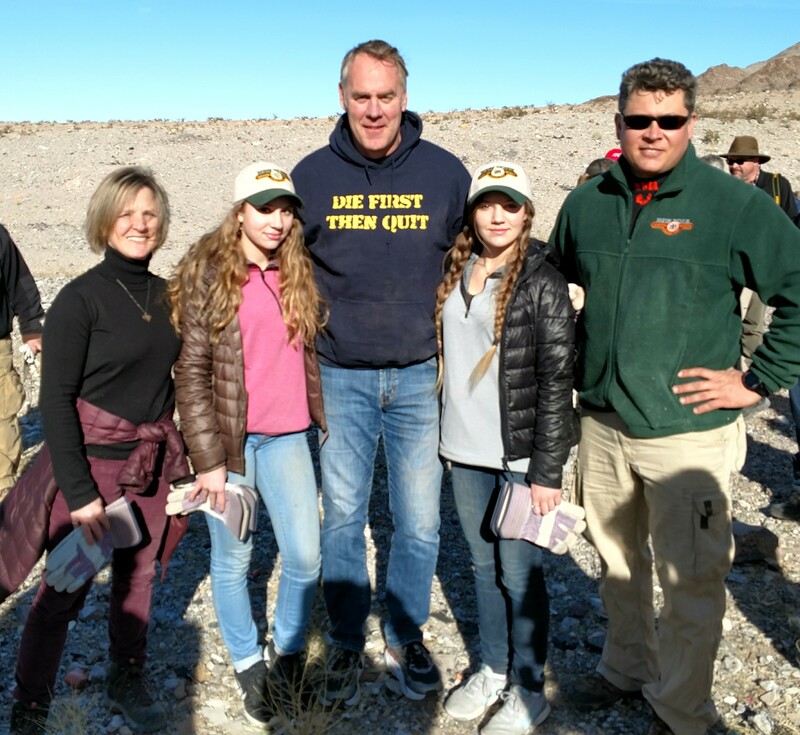 Thank you to our 2016 NYS4-HSS representatives, Director Bill Schwerd, Assistant Director John Bowe, Education Specialist Kenyon Simpson, State Instructor Colleen Kimble and Teen Ambassador Logan Kimble-Lee for making the trip to Las Vegas and for the many miles you logged on the SHOT Show floors representing the program during the week too. 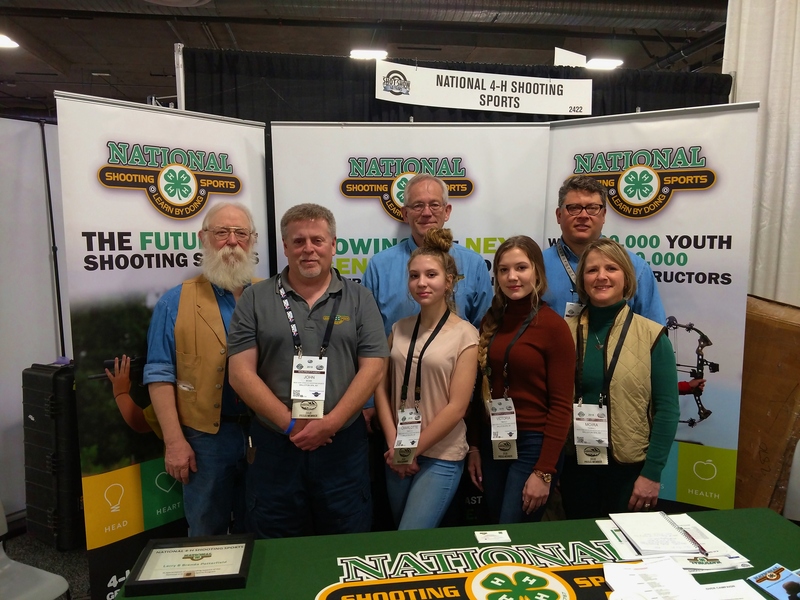 New York 4-H Shooting Sports wishes to extend our sincere appreciation to the National Shooting Sports Foundation and our many friends, donors and sponsors at the 2016 SHOT Show for their gracious and vital support! 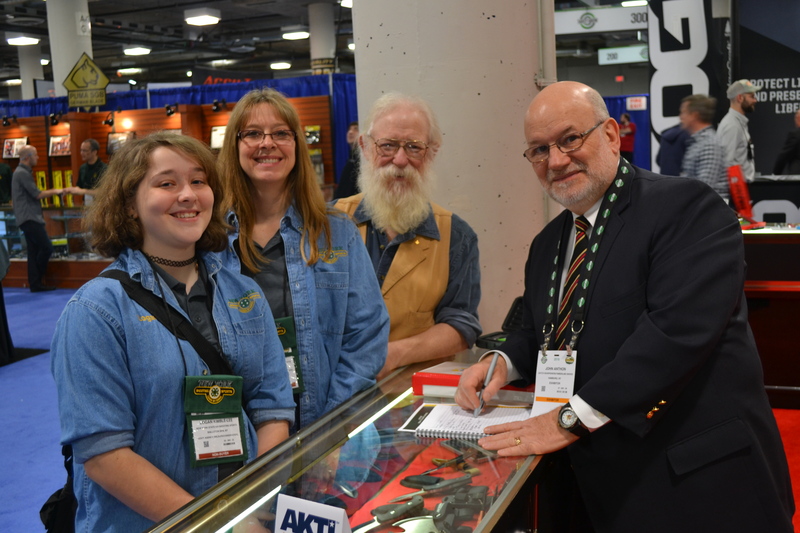 http://www.nys4-Hshootingsports.org for news, upcoming programs and calendar events including forthcoming information on our biggest fundraiser of the year – the 2016 New York State 4-H Shooting Sports Annual Banquet & Auction – where you just might find some amazing items from this year’s SHOT Show! 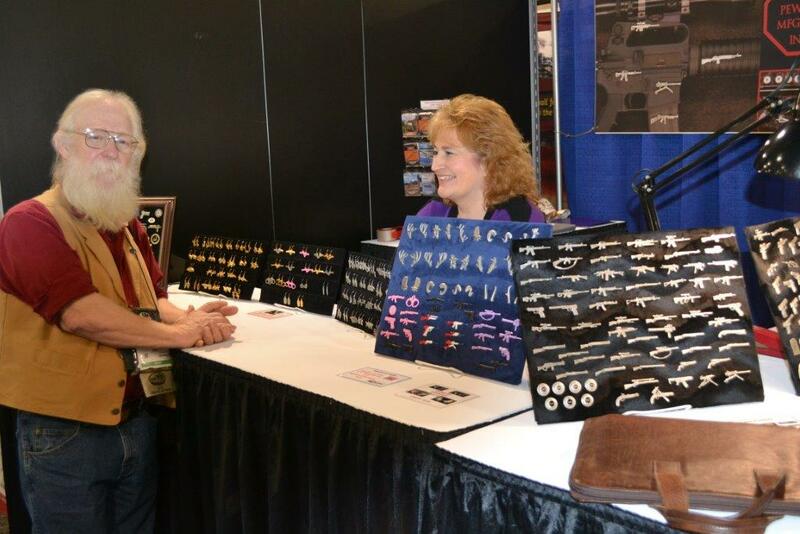 There is sometimes a decline in foot traffic around the SHOT Show exhibit halls on Day 3 though this morning there didn’t seem to be any slowdown in the number of people doing business. It’s pretty amazing considering one of the outdoor writers we met said he’d traveled 10 miles the first day inside the show and had logged five miles before lunch today. 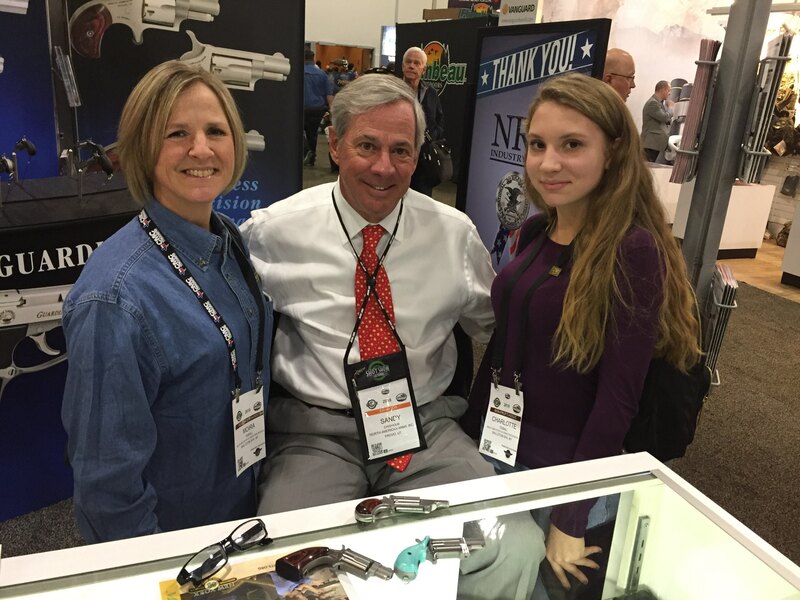 The first two days of the SHOT Show, for us, are spent focusing on current partners and donors. 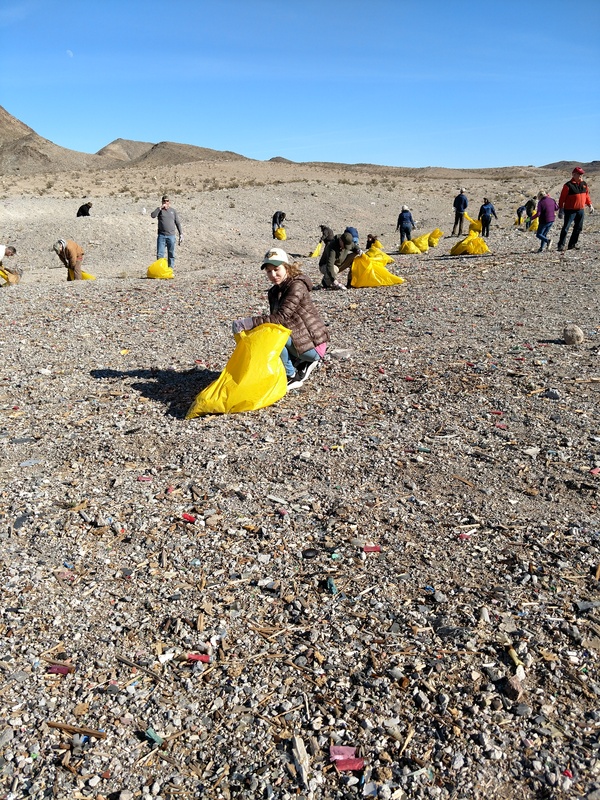 We’re able to drop off materials that demonstrate our successes, visit and thank them for their generous support and donations. On day 3 we get to wander around the show more, look at new items and see new companies. 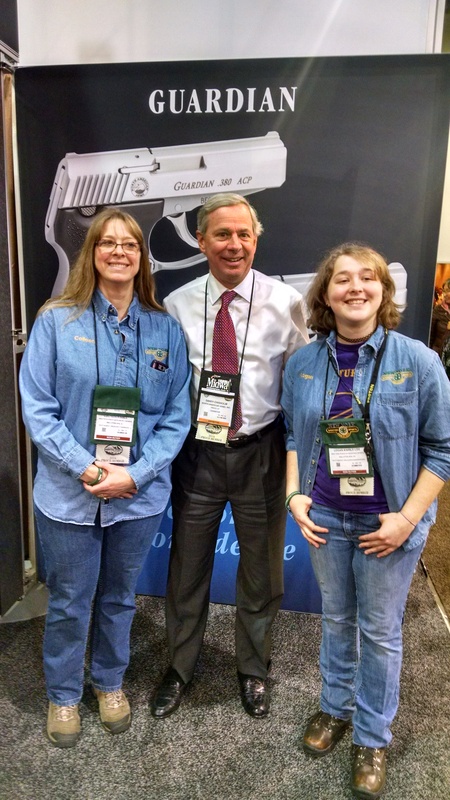 Colleen Kimble (L) and Logan Kimble-Lee (R) with Sandy Chisholm (C) owner of North American Arms – friend and supporter of 4-H Shooting Sports . During today’s walk through the show Logan, Colleen and I visited with Starr at Laughing Rabbit, Inc. (LRI), an innovative woman owned company that’s making great inroads in a traditionally male dominated industry. LRI makes Photon lights which are tiny keychain lights which can be seen up to one mile away. These little lights are an excellent little product at an affordable price. 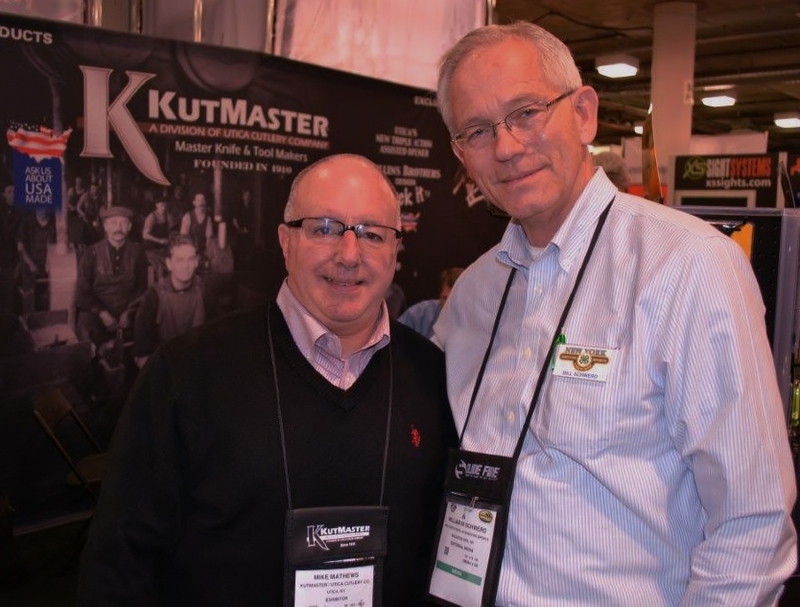 We also visited with the owner of PFI Mold, the maker of Z-blade knives. This small company retooled a product they had developed for the medical industry. The knife is essentially a scalpel blade with an injection molded handle and they developed a locking cap/sheath to allow it to ride in backpacks, coat pockets, and field coats without the risk of cutting the fabric. The blade is surgically sharp and is demonstrated in a company video that shows field dressing, skinning, and caping elk. We later stopped by the Red Rock Outdoor Gear booth to look at the many backpacks, carry bags, and gear organizers they had. Colleen, who raises Clumber Spaniels, also noticed their dog leashes and collars. 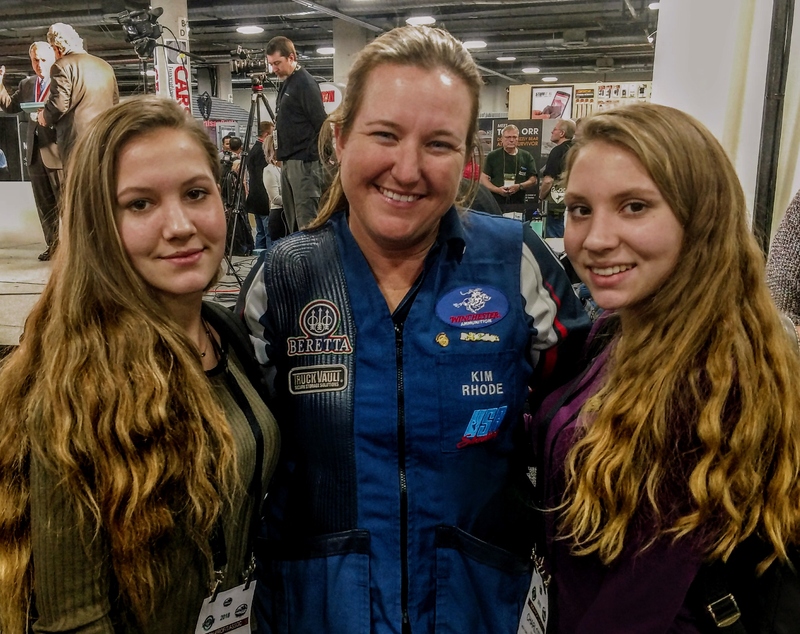 Meanwhile, Kenyon met the owner of Hogue Grips and as they discussed Shooting Sports, the owner recalled how his daughters had grown into great young women due in part to 4-H which can only happen with the assistance of caring parents who make the time for their kids activities. 4-H is everywhere! Over at Industrial Revolution, Logan, Colleen, and I met Dave Canterbury, a well-known survival expert who used to appear in Discovery Channel’s Dual Survival and is the owner of the Pathfinder School in Ohio. There we looked at the Light My Fire knife, which is produced for Industrial Revolution by Mora of Sweden. 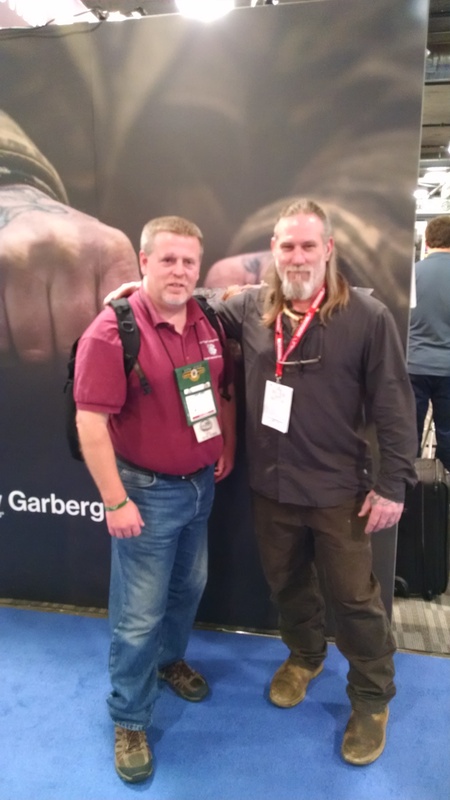 Assistant Director John Bowe with survival expert Dave Canterbury at the Industrial Revolution booth . IR produces the Light My Fire Brand. 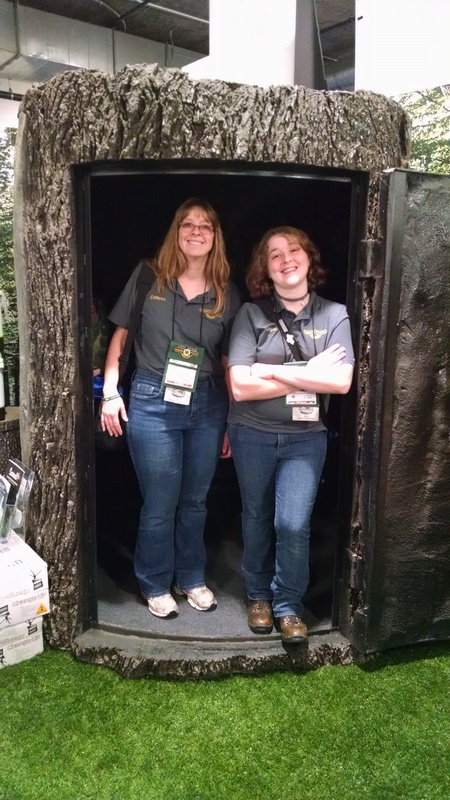 Back at the Adventure Medical/Survive Outside Longer booth, the group ordered a number of Urban Survivor backpack kits to use in upcoming fundraisers and with Hunter Education courses. NYS4-HSS may have some extras available if you need an Extension Disaster Education Network (EDEN) kit. 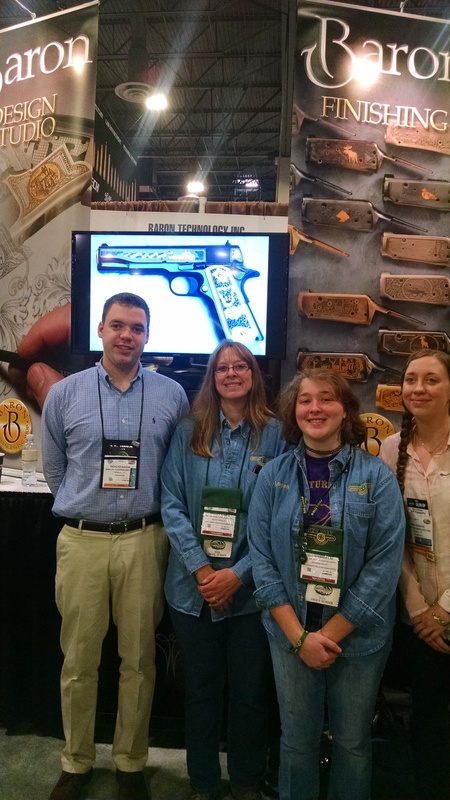 Last year, the National Shooting Sports Foundation (NSSF) opened a SHOT Show store. 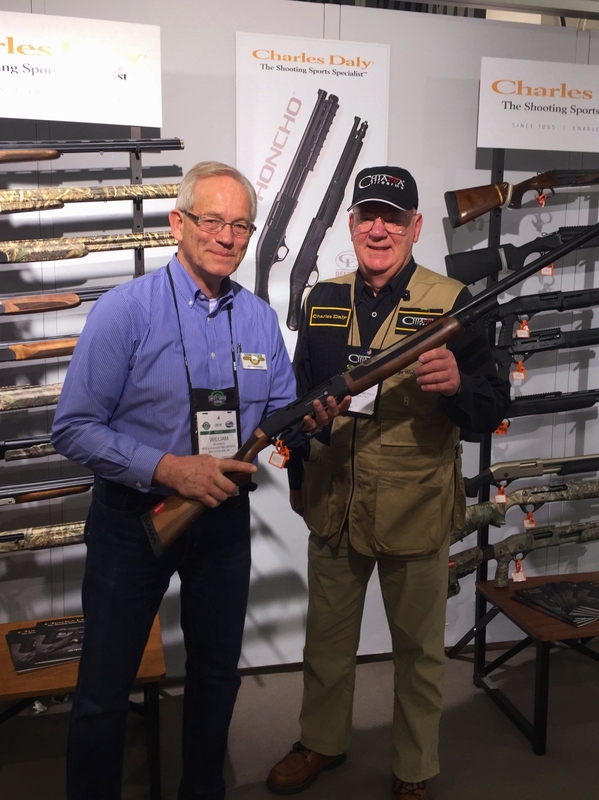 The sales from that store went very well, even better than their staff had expected, which prompted the opening of a second NSSF store for the 2016 show too. Items there included vests, hoodies, polos, t-shirts, hats, and even shotshell shaped shot glasses and wad cutter shaped thermoses. 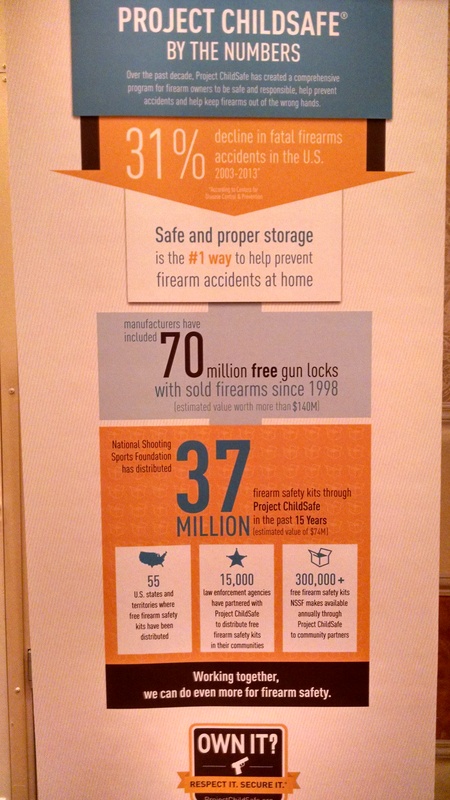 Project Childsafe is a program that is now being operated by National Shooting Sports Foundation. The project has given away 37 million FREE locks in last 15 years! 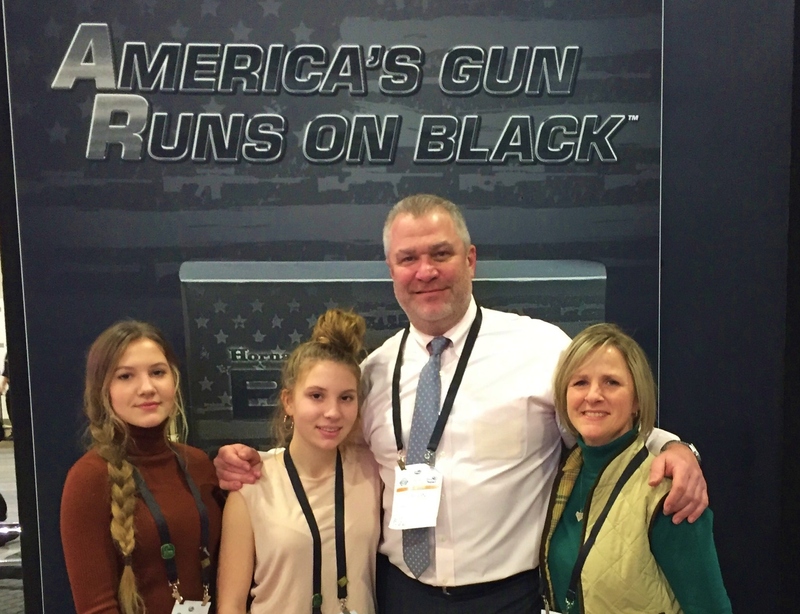 At almost every booth we visited, family was an important part of the success. Even in a time when smaller companies have ties to or are becoming parts very large corporations, there are still strong family ties in the industry. Many of these companies have several generations, or extended family members, engaged in different parts of manufacturing or sales. 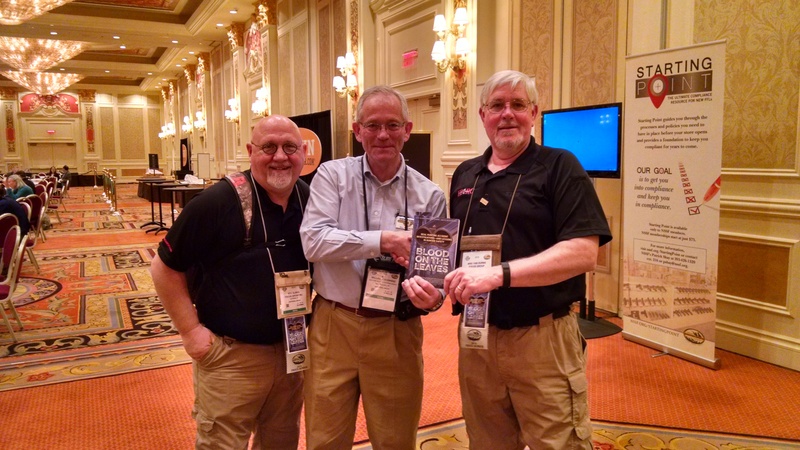 There is so much comradery at the SHOT Show that in a way, it is like one big family in and of itself. 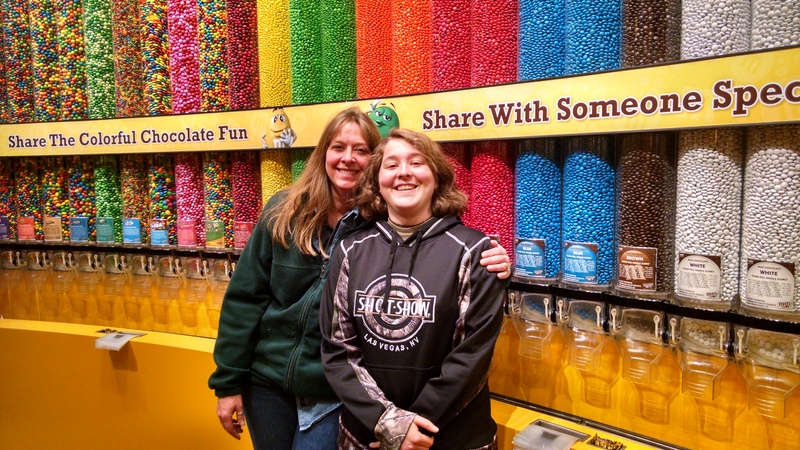 Importantly too, many of these families have connections to 4-H in one way or another. 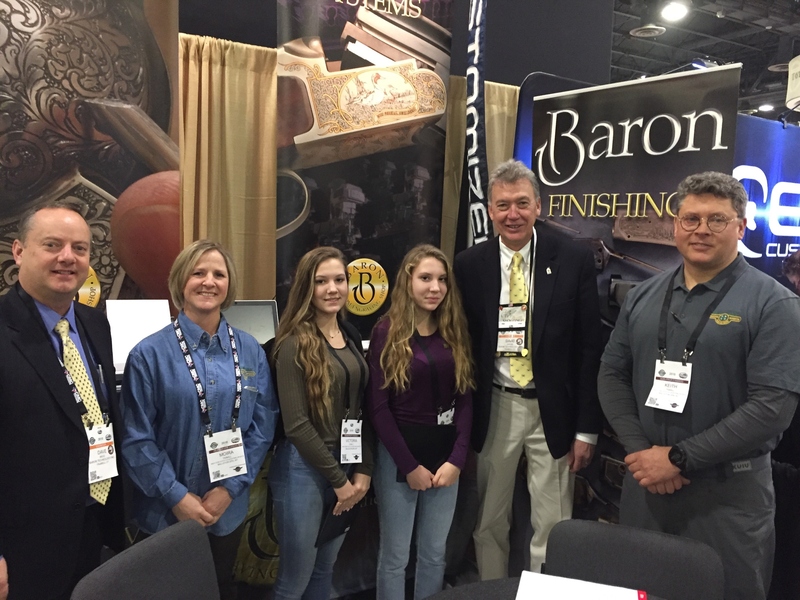 Richard Baron (L), Colleen Kimble (CL), Logan Kimble-Lee (CR) and Emily Baron (R) at the Baron Technology Booth. Until Day 4, safe travels! 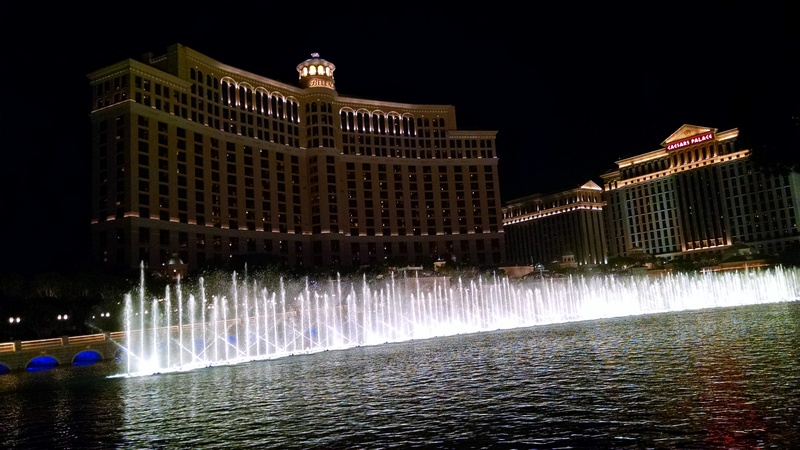 The 2016 SHOT Show will officially open on Tuesday, January 19th, at the Sands Convention Center in Las Vegas, Nevada. 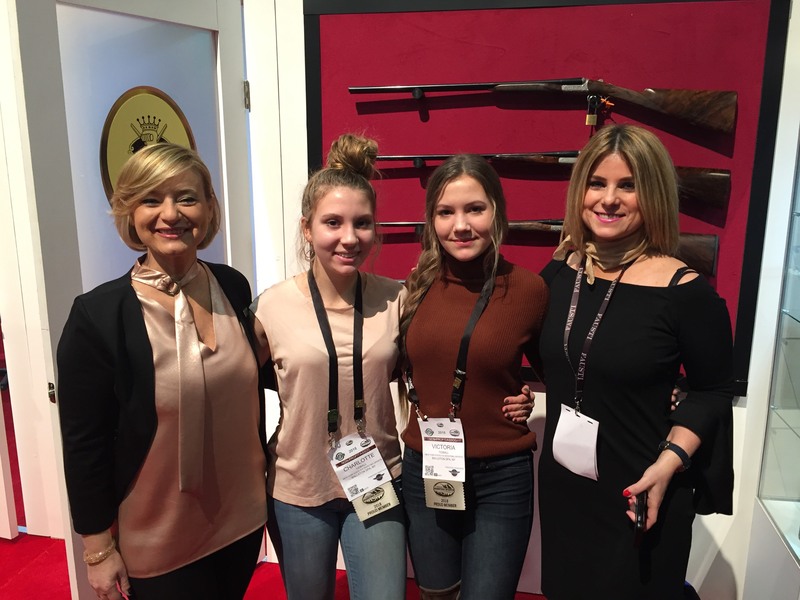 The National Shooting Sports Foundation’s SHOT Show is the largest Shooting, Hunting, and Outdoor Trade Show and Conference of its kind worldwide. 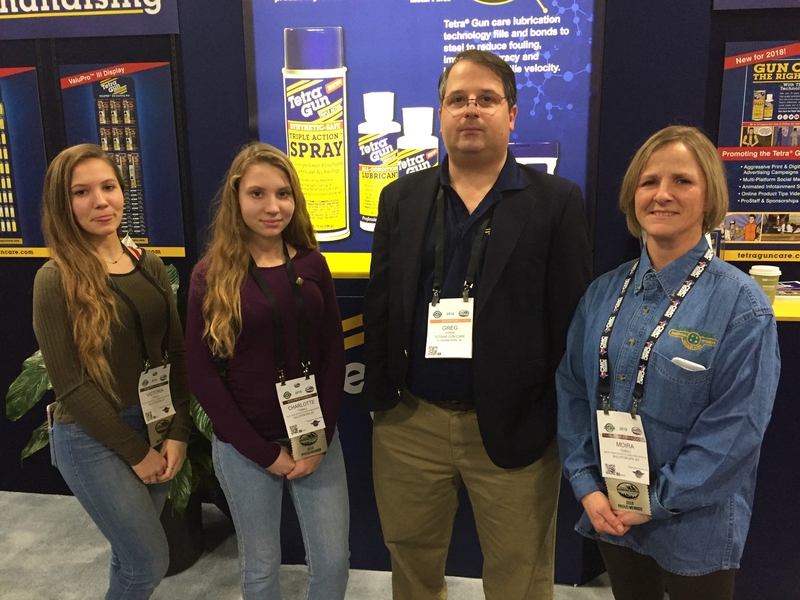 New York State 4-H Shooting Sports representatives to the 2016 SHOT Show include NYS State Director Bill Schwerd, NYS Assistant Director John Bowe, Education Specialist Kenyon Simpson, NYS Instructor Colleen Kimble and NYS 4-H Teen Ambassador Logan Kimble-Lee. NYS4-HSS attends this important annual event to connect with the many corporations, foundations, and organizations that support us and provide supplies for our programming. 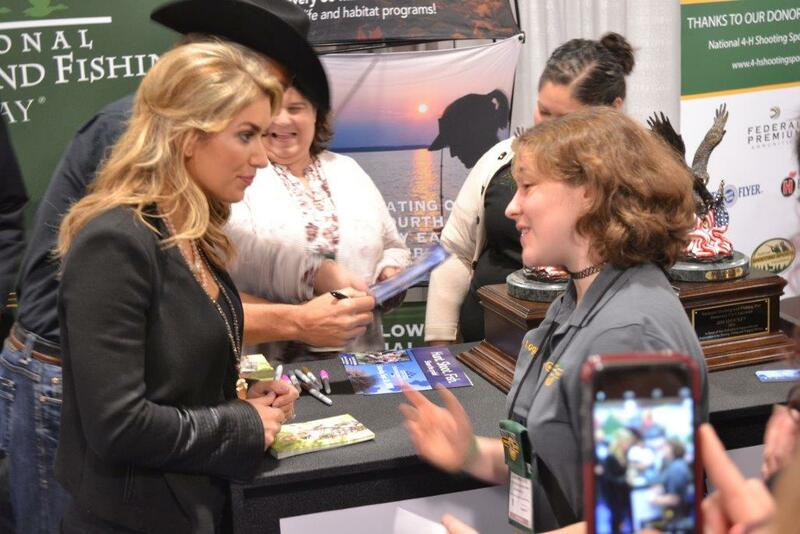 Throughout the show week, a booth staffed by the National 4-H Shooting Sports Committee and National Teen Ambassadors, gives industry the opportunity to meet with the leading youth development program in the country. Our staff and attendees will be able to learn about and see new firearms, archery equipment, safety products and other related program items, first hand, before they are released to the public. 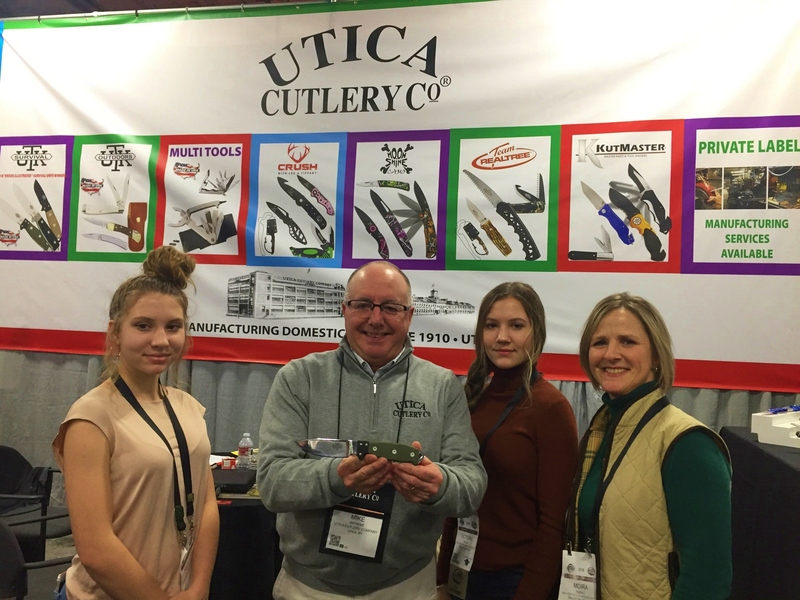 The SHOT Show also provides the ability for staff to acquire some of these items for the NYS4-HSS Program at exclusive special event pricing. Follow us here for regular updates along with photos and news about NYS4-HSS and our supportive partners and their products! The NYS 4-H Shooting Sports program is presently recruiting for their 2013 4-H Shooting Sports Ambassadors. Applications, job descriptions and additional information can be acquired by contacting John Bowe, Assistant Director of NYS 4-H Shooting Sports, at jfb32@cornell.edu . 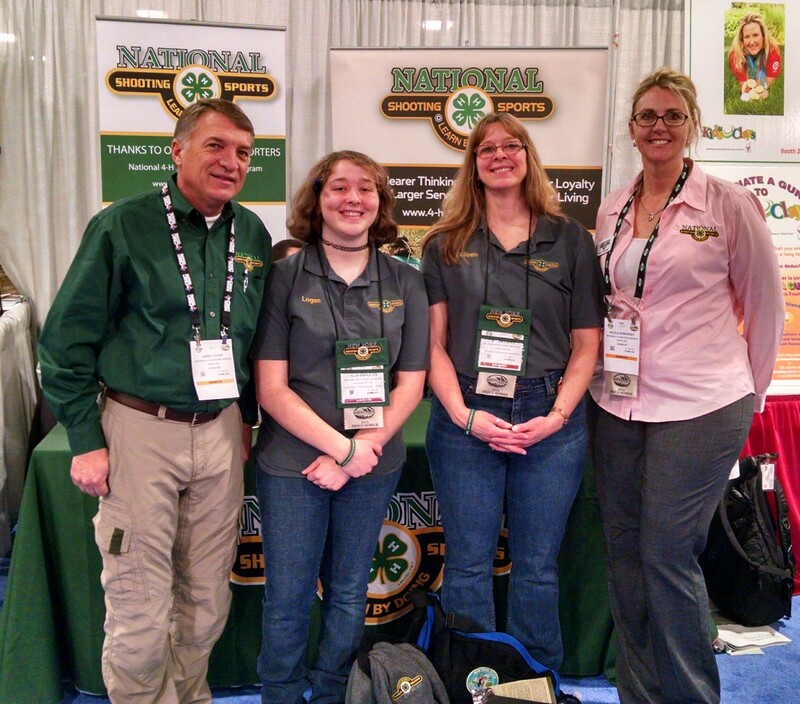 All applications must be completed with the assistance of the 4-H Educator in your county. Completed applications must be received by John Bowe by November 15, 2012.